We are offering our clients Plastic Cutting Tools that comprises of Wood Tools and Paper Tools. The wood cutting tools are used to generate creative design in wood. 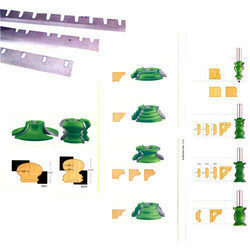 These tools are used on router machines available in various capacities for machining of wood. Plastic corner cutter is used for id cards, lamination sheets, pvc card etc. ags made out can be used to pack food articles like sugar, cereals apart from Cement, Fertilisers. Leveraging on our experience, we are offering a wide range of Plastic And Paper Cutting Saws. These cutting saws are manufactured by our adept professionals using high quality raw material and modern machines in tune with the set quality norms. Offered cutting saws are extensively demanded in different industrial sectors. All machine types, up to the very latest models and includes all paper cutters and 3 knife trimmers worldwide. OEM specifications are used for manufacture. 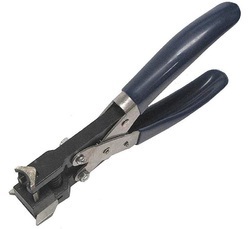 We are a leading trader wide range of Plastic Cutting Tools. Bags made out can be used to pack food articles like sugar, cereals apart from Cement, Fertilisers. Takes in fabrics upto 2 metres in width. Tension control with dummy load and unwind motor in the rear with limit switch controls.